The TAGS01 Triple Axis Gyro system from JR Propo is a feature rich flybarless control system for helicopters. A video preview of the triple axis gyro system is available by clicking on the links under the Modeller Support Centre banner on the right hand side of this page. Please ensure the you refer to operations manual before setting up the TAGS01. The TAGS01 utilizes an advanced control algorithm with a wide dynamic range. This allows unmatched hovering stability combined with extreme maneuverability during 3D flight. â€¢ The CCPM settings that are set in the transmitter are recognized by the gyro, therefore there is no need to change the CCPM settings in the transmitter when installing the TAGS01 (calibration will be required). â€¢ The basic settings can be intuitively carried out using only the switches and dials, which are incorporated separately for each function in the control unit. â€¢ It is possible to connect the unit to a PC for finely detailed adjustments and access to additional functionality. An additional dedicated interface cable and software will be required. â€¢ This product allows firmware version upgrading. 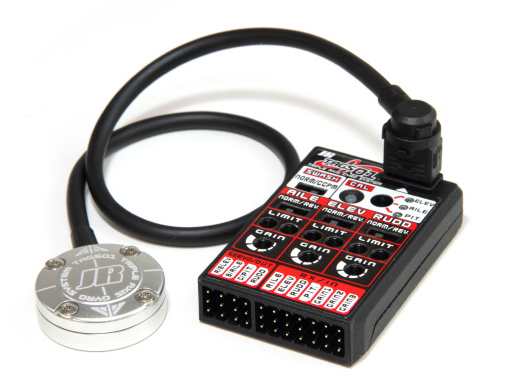 -- The firmware upgrade is carried out by connecting the control unit to a PC using the dedicated USB interface cable, and then installing the firmware. The latest firmware will be available for download from the JR website.